A Journey to the West (aka Pilgrimage to the West) is one of the Four Great Novels of classical Chinese literature. 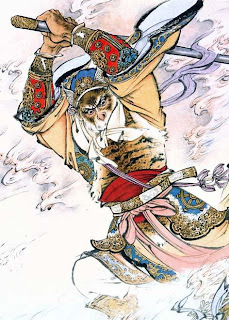 The novel describes the adventures of the Monkey King, Sun Wukong, and the monk Xuanzang's pilgrimage to India in search of original Buddhist sutras. 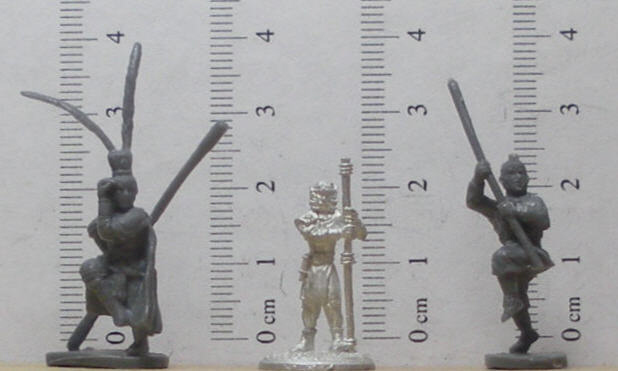 The story and characters are well known in Asia, so it is no surprise that Caesar has produced a limited run set of figures representing the main characters in the story. There are two sets of figures, which differ only in the Sun Wukong figure provided. The first set (P001) consists of Sun Wukong wearing a circlet (after he has joined the pilgrimage), Xuanzang, Zhu Bajie, and Sha Wujing. 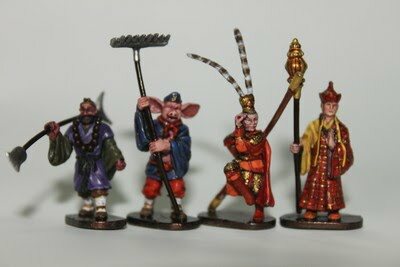 Zhu Bajie, and Sha Wujing are two part figures with a separate right arm that plugs into the body. The second set (P002) has Sun Wukong in his guise as the Great Sage Equal of Heaven wearing a phoenix feather cap, but the other three figures are the same as in the first set. The figures are nice representations of the characters in the story, though Sun Wukong seems to be modeled a little more on the movie/TV version of the character, since his features are more human than monkey-like. I end with a comparison between the Male Loresong Faen (Iron Wind Metals 67-003) from the IWM Arcana Unearthed line of miniatures with the Caesar Sun Wukong figures. When I first saw the Faen figure with the staff, circlet, and sideburns, the first thing that popped into my mind was that it was the Monkey King. I was originally going to do a conversion of this figure to make Sun Wukong, but I'll reconsider that project now that I have the new Caesar figures. Hi Eric. Where do you get this set? Does anyone carry it in North America? Hi Chen-song, I'm not aware of anyone in NA who stocks these figures. I ordered the figures from Always Model in Taiwan and they arrived in about 5 days time. The sets are not listed on the Always Model website or eBay store, but you can send them an e-mail to place an order. They're not cheap at US$3.95 for 4 figures, but I thought they were worth it. Thanks Eric! I'll email Always Model and ask. 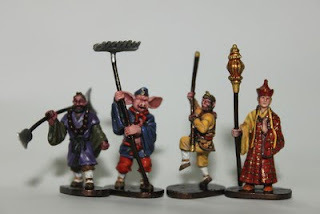 These would be great in a Chinese-themed HoTT army. I used to love the TV serial, which we got as late afternoon/early evening entertainment before 'Daytime telly' had been invented!! AHH! Monkey! PHa, pha, pfwuoosh! and a cloud (a ride-able cloud!) would magically appear! Fantastic, I'll have to get these!! I've met several old school gamers from the UK who have fond memories of the Monkey King from watching the show when they were younger. The other Chinese TV show that seemed to be popular with them was The Water Margin. Interesting... So at one point these Chinese TV series were shown in the UK? I'm guessing so. Aussies of a certain age on the other hand, seem to have a fondness for the show The Samurai. Yes - I was watching it at about 4.30pm in around '78/79, and I think it was then repeated late night's a couple of times in the early/mid '80's. It's quite cult over here. I'm surprised Ceaser haven't released them here, but they do do this Ltd.Ed. stuff, the footballers was another one we didn't get and yet Football is massif over here? A very imformative site and i have learnt something new..always usefull...A monkey series set from caeser!!!! This TV series was a must when I was at school in the UK..(that and the water margin)These I must have ! !I can order these from caeser direct?. what should I ask for?? I don't think you can get the minis directly from Caesar. They still have a few sets left. I purchased a set of 4 figures and it says monkey story on front would you know anything about this or where I could get more info? You can read this article on Wikipedia for more information. For an alternate language version of the article, go to the left of the page under "Languages" and find the version that works for you.